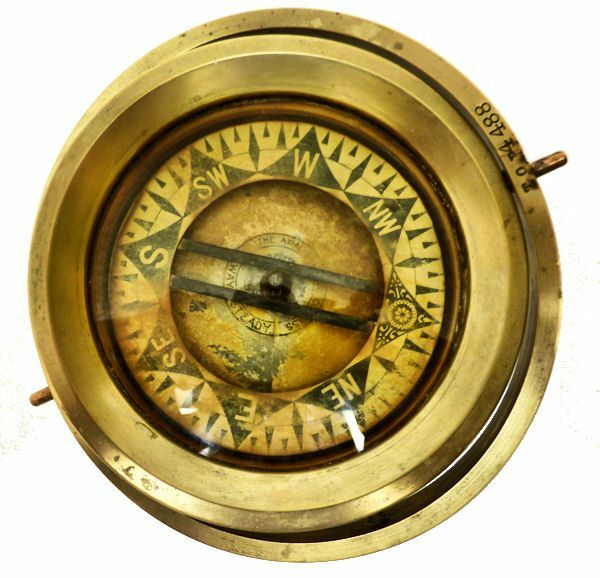 To view our current inventory of high quality antique and vintage compasses and binnacles, click here! 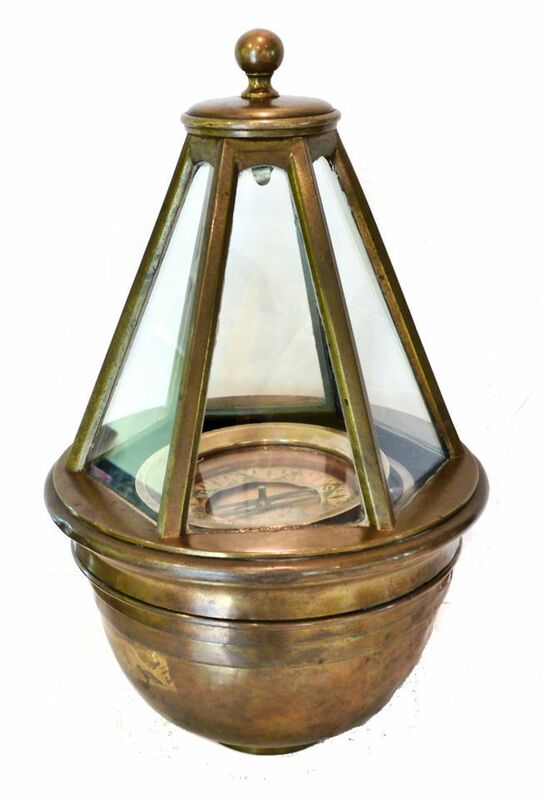 PRESENTED is an interesting antique skylight binnacle fitted with an American compass by D. Baker of Melrose, Mass. 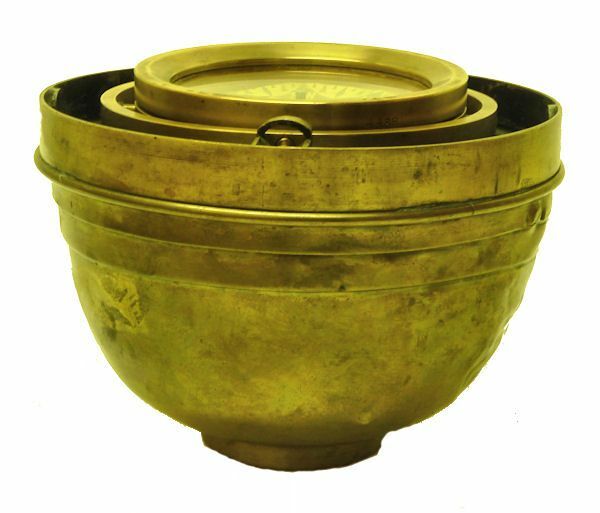 The tub of the binnacle is of spun copper with a heavy machined insert at the bottom which is threaded to accept a brass pipe which is not included. The frame of the skylight portion is of a forged casting rather than made of individual pieces of stamped brass as is found in contemporary versions of this design. It is very rare to find a skylight binnacle of this obvious age since they did not become popular until the 1950's. We estimate that this one dates back to the last years of the 19th Century making this the only true antique skylight we have discovered. 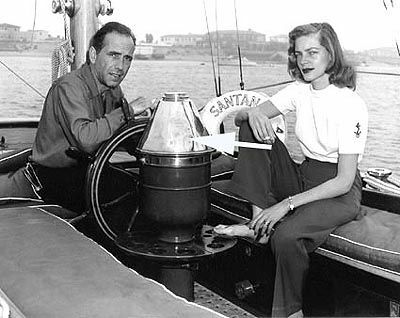 Our experience with them dates back to 1948, the year that Humphrey Bogart and Lauren Bacall stared in a movie called “Key Largo” which was a gangster film set in the Florida keys and featured a motor yacht name “Santana“. Binnacles such as these became popular starting in the 1920's. Bogie also had one in the cockpit of his well known yawl Santana. It is shown here covered with a chrome hood.Their popularity accelerated after the movie for those who could afford them because they were very expensive. Years later, in 1979, I insisted on having one on our ketch Bagheera which served us well during seven years of ocean cruising. PERKO discontinued making them about 1954, and Ritchie did the same. The only source was Danforth which stopped their production in 2009 at a price of $3800.00 in chrome. 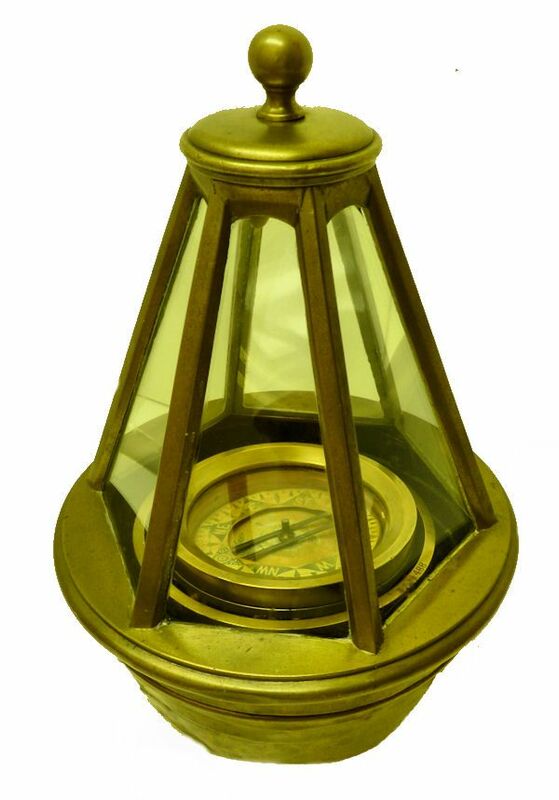 In May, 2011, Ritchie Navigation brought back a skylight binnacle with a retail price of $3600.00 in brass. THE COMPASS is an old paper card which has aged over the years. It is in reasonable condition, but has some light rust colored sediment that is covering some of the printing which still can be made out. The printed paper card has an unusual geometric design as its North pointer over a circular cartouche which is used on all Baker compasses. It is signed around the center "D. BAKER, The Axial Balance Compass, Melrose, Mass. Sept 1885. The card is divided into eight Cardinal Points, each of 45 degrees, and then into 1/8 and 1/16th points. Each point subtends an arc of 11 1/4 degrees comprising in total 360 degrees of the compass. It rests on a brass pivot with a cap. It is solidly made and housed in a glazed, heavy brass case with weight at the bottom. The compass over the years has lost much of its magnetism, is binding and is slow to point to North, 7" inches in diameter. If wanted, a fully functioning compass of the same size can be furnished as a subsutute. OTHER MARKINGS: The number 4488 is stamped on the edge of the bezel and repeated on the bowl and gimbal ring. There are no identifying marks on the spun copper tub. BRIEF HISTORY OF COMPASS MAKER, D. BAKER: Baker was born in New Bedford, MA in 1792. Baker is listed in Webster's and also in the Whaleman's list which shows he was a dealer in nautical instruments. Later, he worked with a partner, Thomas Hooper at 54 Ann St., in Boston, MA. Later still he relocated to Melrose, Mass which is part of the greater Boston metropolitan area. PROVENANCE: Purchased at a marine auction on the west coast with various other items. Ownership prior to this is unknown. CONDITION of TUB: The shows considerable wear and there are numerous small dents mostly on one side. These are cosmetic only and do not effect its strength.There are the usual other minor marks of age.There is a loss of black paint on the inside. SHIPPING & PACKING is an additional charge to the buyer and will be determined at the time of purchase. OUR UNCONDITIONAL NO NONSENSE GUARANTEE: If not completely satisfied with your purchase it may be returned within five days of receipt in its original packaging if without damage. Return items must be insured for their full value. Only a prior email authorization from us for the return is required. Shipping charges are included in this offer within the continental United States if the error is due to our fault.